Karin and Evans’s 1,100 sqft , 1940 traditional house was bursting at the seams and they were ready for a major overhaul. At our first meeting, they presented me with an expired set of approved construction documents that were drafted by a reputable Architectural Office a few years back. After discussing priorities and needs of their family of four, as well as budget concerns, it became clear there were some major flaws in the floor plan layout. Upon further review, there were unnecessary changes affecting the cost of the construction as well. We decided the best course would be to start with a new set of plans, addressing their needs, with an emphasis on total energy efficiency of their home. Features such as LED lighting, a Whole house fan, additional roof insulation and a tankless water heater were on the list of must have energy saving items. Installation of roof solar panels is planned in the very near future. K&E’s biggest concern was losing too much of their beloved back yard so we focused on creating large sheltered outdoor space that can be used all year round. An open floor plan and vaulted ceilings were a must in the new addition to create an airy feeling, with windows strategically placed to create pleasant views of the backyard and a stunning avocado tree. In addition, North facing Velux skylights were a no-brainer in the living/kitchen area, creating fantastic views of all the surrounding trees and California's blue skies. They are solar operated with a remote controlled window mechanism that features a raindrop sensor that automatically closes with the first drop, making it efficient and practical. The old remodeling plans unnecessarily enclosed the existing entryway to the bedrooms, creating a long hallway as well as cutting one of the bedrooms down to the size of a closet; barely fitting a twin bed! Entering the Laundry room from the dining room area was not a smart or well thought out solution. The exterior porch barely fit two small chairs and was not practical for a family of four that likes to entertain. Working closely with local Architect Vartan Jangozian & Associates we created two separate wings. Keeping the old house layout, with a hallway to two existing bedrooms while sharing a bathroom and Master Suite wing, consist of a bedroom and a walk-in closet as well as a beautiful master bathroom. The dining room area had to accommodate a huge 4” X 8” antique dining room table, a family heirloom, while still having enough room for a good traffic flow. When it came to the kitchen, an adjacent walk-in pantry was in order. This gave them ample storage which is a must for any serious cook. The Guest bath was inspired by our first purchase: a grey-washed vanity (great quality and value with countertop and sinks included). 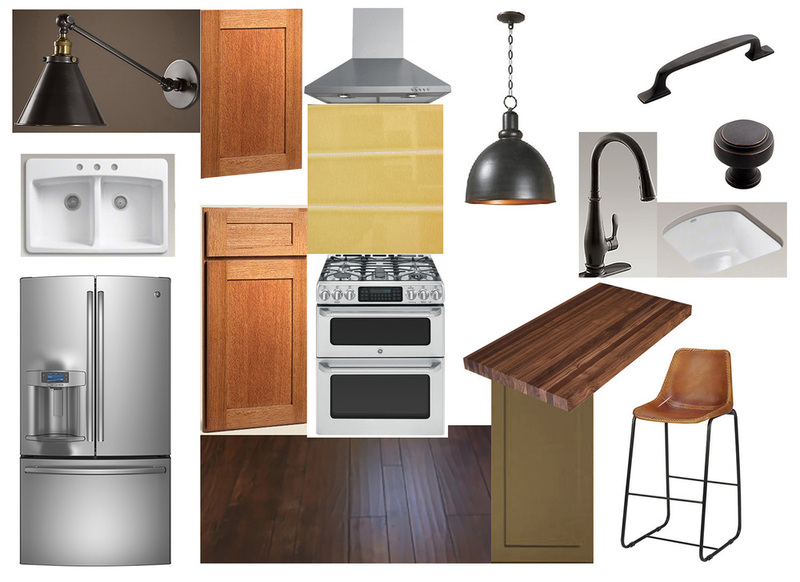 I combined it with a warm gray/taupe color scheme, including a big recessed medicine cabinet and vanity lights. The porcelain floor tile has a slightly washed concrete-like pattern. Brushed nickel /polish nickel hardware adds great detail. 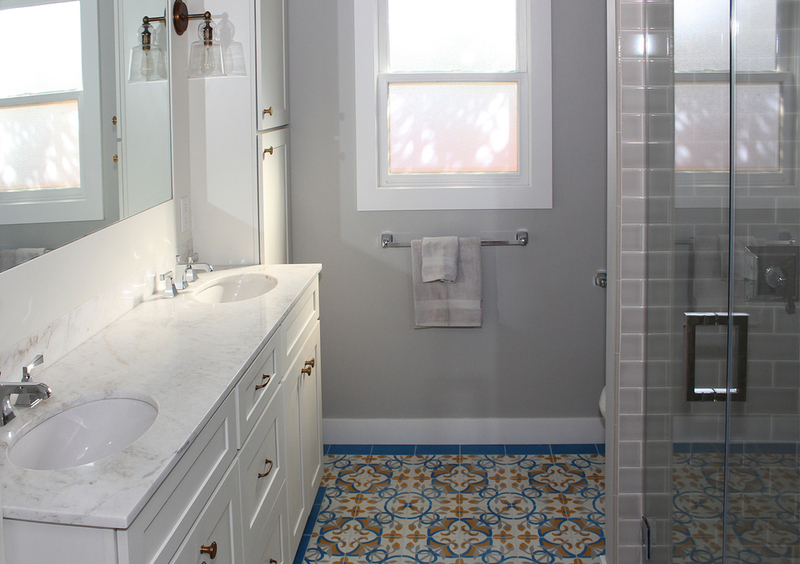 The Master Bathroom evolved around a beautiful ornate cement tile from Granada tile. We kept the cost down by picking from the “In stock “ selection that is available in LA, saving on the pricey shipping cost. Check out Granada Tile blog! To assure fit and finish, the built-in cabinetry was manufactured by the same cabinet company as the kitchen, made in the USA by a trusted vendor we work closely with. Sconces and cabinet hardware were carefully selected and provisioned in Antique Brass to tie in with the yellow/mustard tile color. Subway tile was selected from the Allen+Roth collection at Lowes. Chrome faucets are Memoirs by Kohler, cast iron tub and shower pan both by Kohler. Both bathrooms have water efficient Kohler dual flush toilets. Shower enclosures were custom by Glass World in Burbank. Vanity countertop Arabescato Venato marble was picked as a prefabricated piece, cutting cost of slab purchase. Its grey, white and gold veining matched our color scheme perfectly. The Kitchen design Karin and Evans both agreed on was a design with maple bottom cabinets and a warm grey upper cabinets in a shaker design with craftsman mullion detail. Pendant lights by Brian Schmitt, Schmittdesign.com were a worthy splurge, which became a focal point of the entire room. A 1.5” Character Walnut Butcher Block Island countertop ties in all the wood colors in the room. It was carefully chosen for its distinctive color variation. A Silestone Blanco Maple countertop was used in the rest of the kitchen. White subway tile was installed in a herringbone pattern, adding detail while tying in with the exquisite kitchen pendants. Created by Klara Phillips 2013.